This post is brought to you by Wholefully brand partner Meijer. 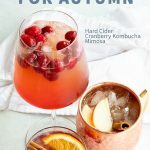 Skip the sugar-filled mixtures in these three autumnal kombucha cocktails– Mulled Wine Kombucha Spritzers, Autumn Apple Kombucha Whiskey Moscow Mules, and Hard Cider Cranberry Kombucha Mimosas. When people find out that I’m “into” healthy living, they sometimes clam up because they think I’m judging them. They order a salad instead of the burger they really want, or tell me about the marathon they’re thinking of training for or, god forbid, skip ordering a cocktail because they think I’ll criticize them. I take it as a compliment—folks are trying to connect with me and that’s a very kind-hearted thing to do— but my closest friends and family know that (1) I so don’t have the judgment personality (at least not anymore– 25-year-old me had some work to do), so that’s just not something you ever really have to worry about with me, (2) I’m trying really hard to harness the power of my brain’s perpetual conga line to focus on kindness, compassion, and gratitude through a regular mindfulness practice, and (3) GIRL, I KNOW BETTER THAN ANYBODY THAT SOMETIMES YOU JUST NEED A COCKTAIL. 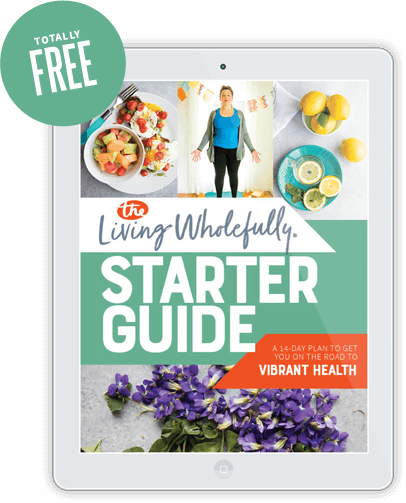 I believe that listening to your body and giving it what it needs is one of the healthiest, most nourishing things you can do. Sometimes that means eating kale salads for a week straight, and sometimes that means sipping on a cocktail after a hard day at work. 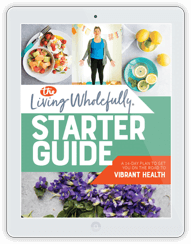 Our goal here at Wholefully isn’t really to tell you specifically what to eat or drink and what not to eat or drink—our goal is to get you listening to your body and responding with what it needs. 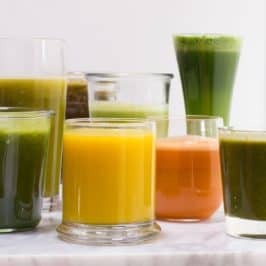 For some of you with medical or dependency issues, cocktails might be off the table, but for others, cocktails might be a completely healthy part of your diet. 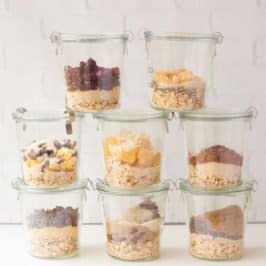 Skip the sugar-filled mixers. I promise you can make a mighty good cocktail without the use of soft drinks or cocktail mixes! Bonus: sugar and alcohol together is a recipe for a highly unpleasant morning after. Some people theorize that the less added sugar you have in your cocktail, the less chance you have of a wicked hangover. 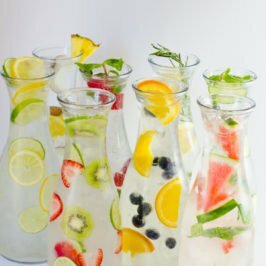 Some of my favorite cocktails are made with flavored sparkling water—no added sugar at all! Try adding some nutrition. 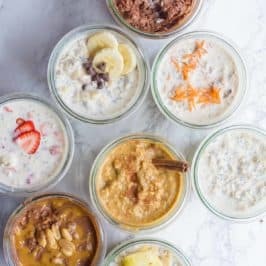 Booze has gotten the reputation of being “empty calories” because it’s mostly void of nutrients, but you can help balance that out a bit by using mixers that do add some nourishment. 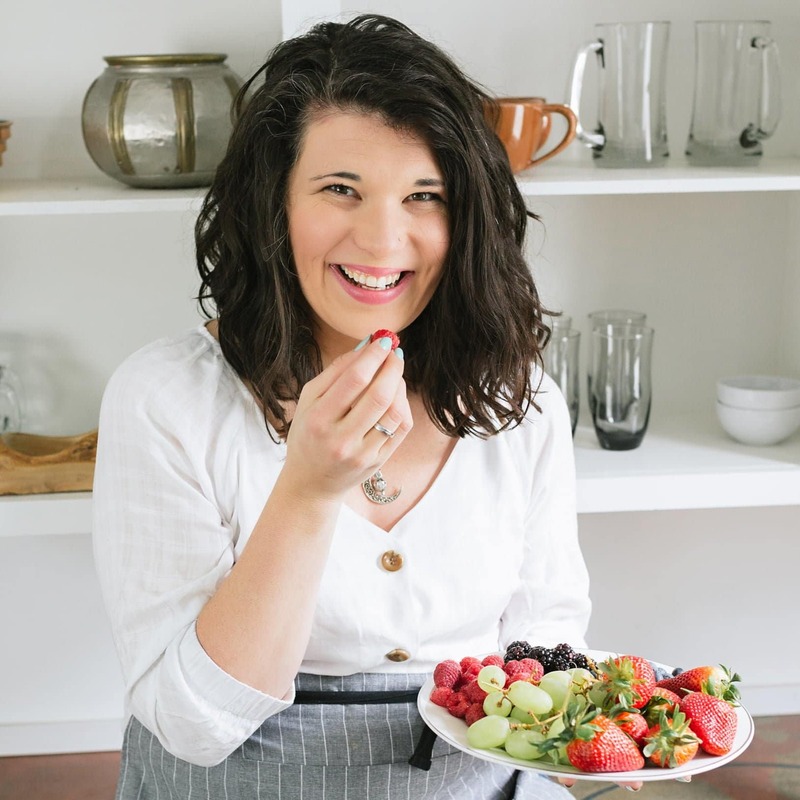 I like using 100% fruit juices, fresh fruit, and, like I do here, kombucha! 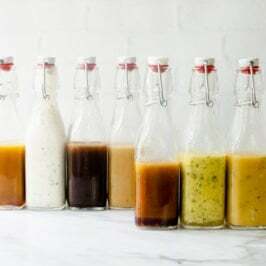 Kombucha cocktails are a great way to get a boost of gut-friendly probiotics while you sip away on your cocktail (plus, kombucha is already slightly alcoholic). Everything in moderation. I’m not gonna lie, I had a wild bender or two (or three) in college, but long gone are the days where I drink to get drunk. A healthy perspective with cocktails is enjoying them mindfully and with moderation. Curious how you drink a cocktail mindfully? Hold the glass in your hand and observe the color and the temperature. Enjoy the way the glass feels in your hand and the weight of it. Take a deep inhale and savor the scents. Then, take a small sip, and enjoy the way the flavors bloom across your tongue, and enjoy the way the cocktail warms your throat. Sipping on a carefully crafted cocktail should be a beautiful, romantic experience that deserves your full attention. Chugging cocktails while you’re distracted by something else is not the stuff of healthy living. Save your unconscious beverage slamming for plain water. I’ve been playing a lot with kombucha cocktails in my kitchen lately, and I thought I’d show you three options I came up with! I grabbed all the ingredients (including the alcohol and the kombucha) at my local Meijer store. They have an impressive selection of beer, wine, and liquor, as well as one of the best kombucha selections of any of our local supermarkets. I love that I don’t have to stop at a specialty liquor store to pick up goodies—I just grab them while I’m doing my regular grocery shopping at Meijer! Alright, let’s have some kombucha cocktails, shall we? Mulled wine is one of my favorite fall and winter treats, but I have to be honest, I rarely take the time to actually make it myself! That’s why I was so happy to find that a winery out of Traverse City, Michigan sells a red wine that’s already infused with all the wonderful spices that you usually find in mulled wine—and I can pick it up at my local Meijer store. 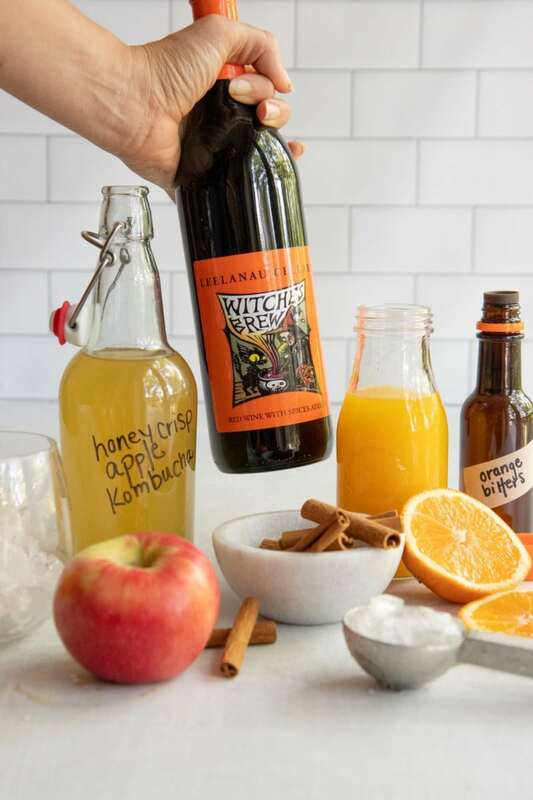 Witches Brew from Leelanau Cellars is a seasonal wine that you can only grab this time of year. 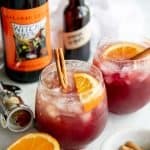 It’s meant to be served warm or hot (like most mulled wine), but the second I tasted it, I knew I wanted to turn it into a festive chilled spritzer using apple-flavored kombucha. 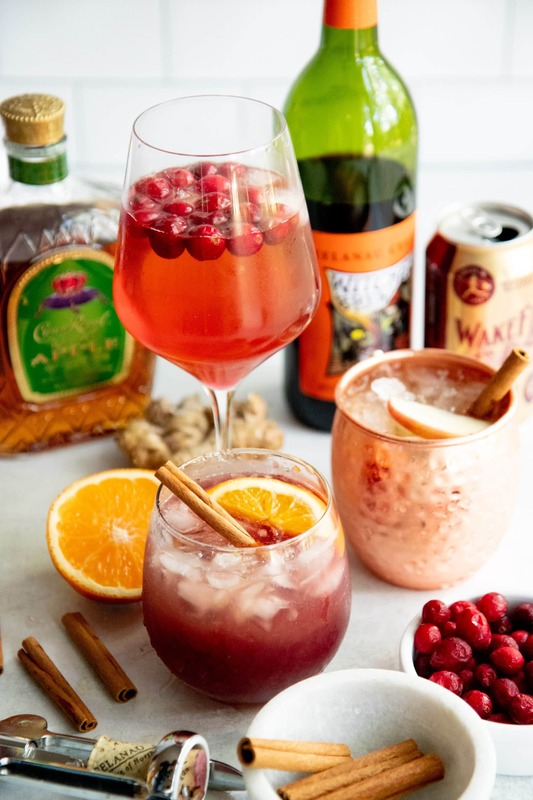 Here in the Southern Midwest, fall can be a bit of a rollercoaster ride—just last week we had a 95° day followed by a 55° day—so getting the flavors of fall in a crisp, refreshing cocktail is the perfect answer to this time of year (that and pumpkin ice cream). This cocktail uses apple-flavored kombucha that I picked up at Meijer, but any kind of kombucha would work if you have trouble tracking down the apple-flavored. I think this would be really great with ginger kombucha, too. Whatever you do, don’t skip the dash of orange bitters at the end. It can be easy to assume that just a little bit of an ingredient can’t make much of a difference, but I promise, it does. And trust me, once you buy your first bottle of orange bitters and start using it, you’ll be hooked! 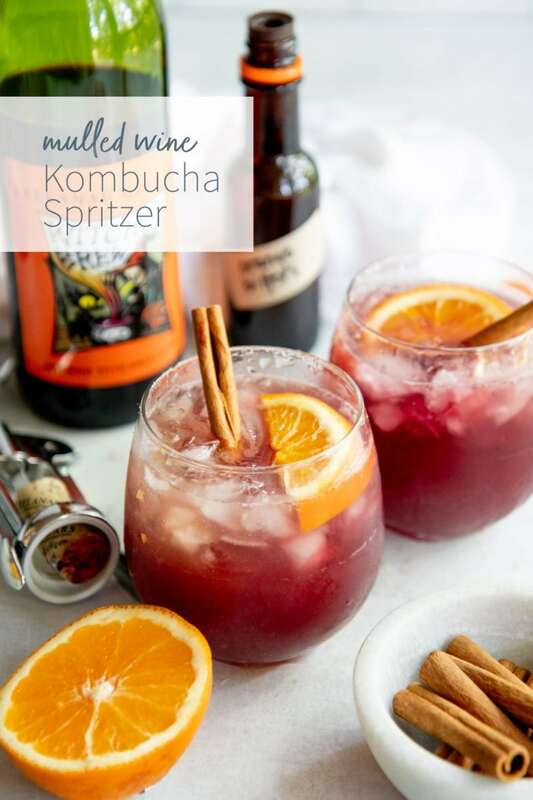 This crisp and refreshing Mulled Wine Kombucha Spritzer is perfect for surprisingly-warm fall days. Fill a highball glass or other large cocktail glass with crushed ice. Pour in the mulled wine and orange juice, and stir gently to combine. Top off with the kombucha, a few drops of the bitters, and garnish the glass with an orange slice and cinnamon stick. Your typical Moscow Mule is made with vodka, spicy ginger beer, and some tart flavor from lime juice—it’s a decidedly summer cocktail that is super refreshing on even the hottest day! 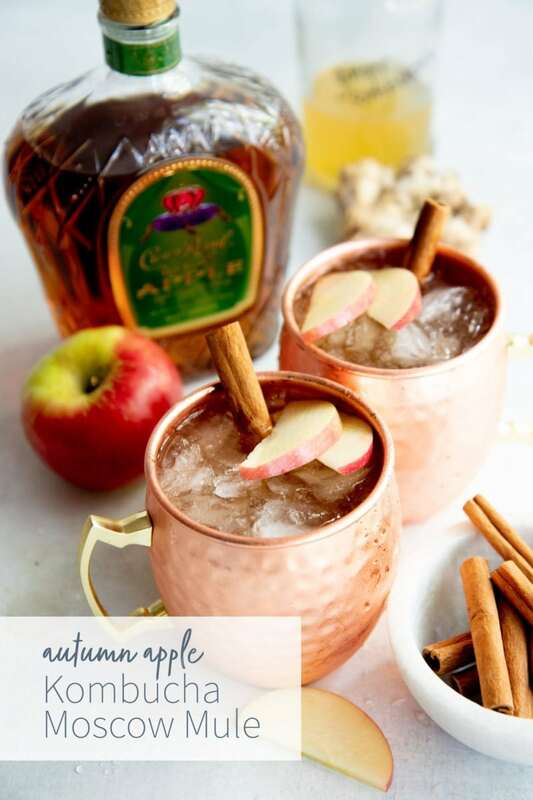 My autumn version is a bit cozier and warming, thanks to swapping out the vodka for Crown Royal’s Regal Apple Whiskey. I’m not a huge whiskey fan, but this flavored whiskey makes just the perfect base for fall cocktails. It tastes like candy! I mix the Crown Royal with ginger-flavored kombucha (my twist on the ginger beer) and fresh-pressed apple cider. The end result is a cocktail that tastes like a über-refreshing caramel apple! 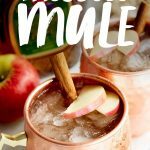 I picked up some classic, hammered copper Moscow Mule mugs at Meijer to serve these in. 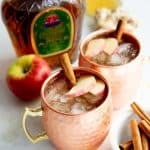 An Autumn Apple Kombucha Whiskey Moscow Mule is a warming fall twist on the classic summer cocktail. Fill a Moscow Mule mug with crushed ice. 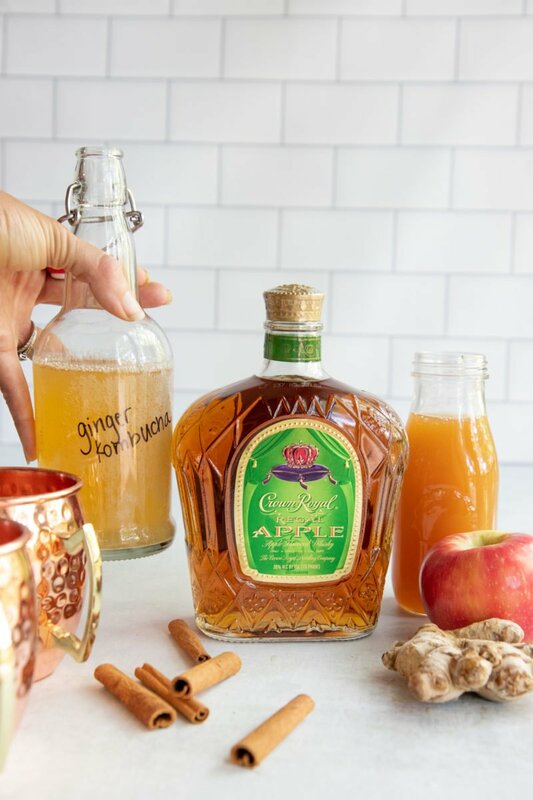 Pour in the Crown Royal Regal Apple and apple cider, and stir gently to combine. Top off with the kombucha and garnish the glass with an apple slice and cinnamon stick. Hard cider is my jam lately. When I cut out gluten, there was a big, craft-beer-shaped hole in my heart, but soon I discovered the joy of craft hard cider, and I was hooked! There are so many interesting and varied tastes in the world of hard cider, and it makes me so happy that my local Meijer store has a great selection for me to chose from. 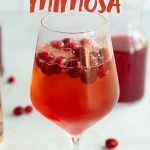 This twist on a mimosa uses Blake’s WakeFire Hard Cider, which is one of my favorite ciders on the block! It’s a traditional hard cider that is infused with cherries and orange peels, and wowzers, does it make a great base for a cocktail! 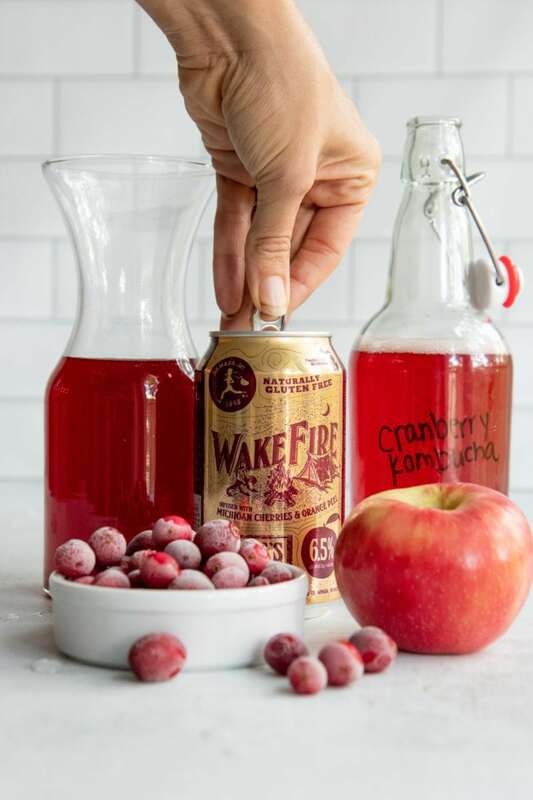 I combined WakeFire with cranberry juice, cranberry kombucha, and some frozen cranberries for a fun and festive cocktail that would work just as well for holiday parties as it would for fall sipping! This drink is bubbly, fruity, and not-too-sweet. 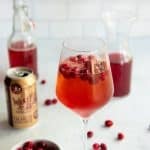 I personally used 100% cranberry juice here, which is tart, but balances with the sweetness of the hard cider beautifully. 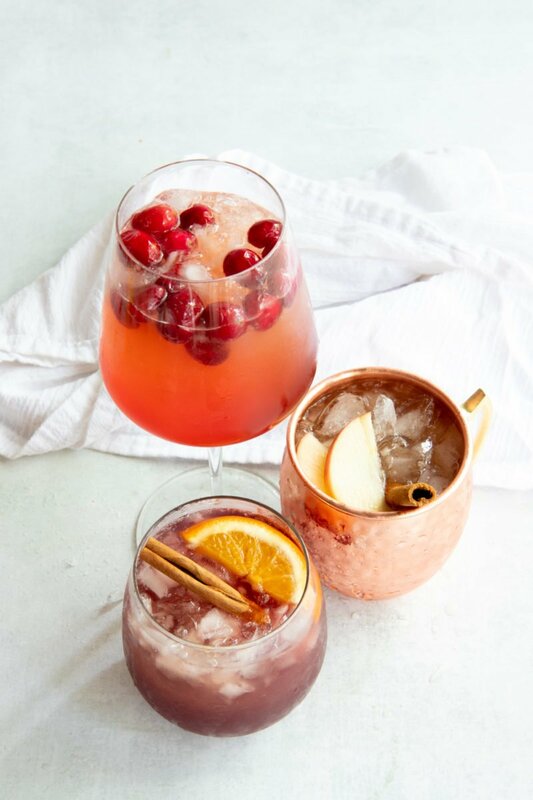 If you want a sweeter drink, pick up some 100% juice cranberry cocktail—which is usually cranberry juice mixed with a bit of apple or grape juices for sweetness. 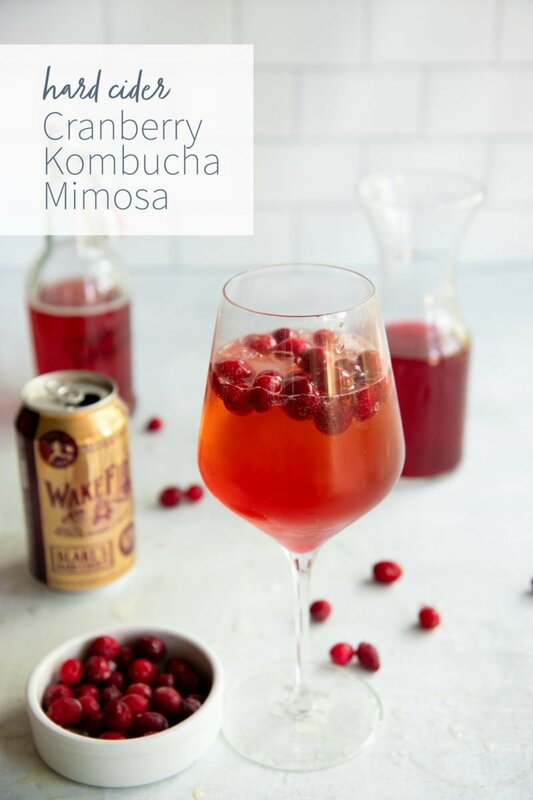 This Hard Cider Cranberry Kombucha Mimosa would be at home both at cozy fall brunches and festive winter holiday gatherings. Place the frozen cranberries in a wine glass or champagne glass. Add in the cranberry juice, kombucha, and hard cider. Stir gently and serve. 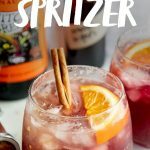 If I had to pick one of these as my favorite, I’d say I loved the Mulled Wine Spritzer the most, but they are all stupendously delicious! Happy fall! I hope you enjoy. All opinions are entirely my own. Want to be a sponsor? Let’s work together!